Great question! After seeing your picture, and having a conversation with someone today about tomatoes, I realize I am NOT eating enough tomatoes! I purchased some cherry tomatoes at Trader Joe's, and they aren't very good, I need to get the big juicy summer tomatoes instead! What was I thinking?? Your meals sound great, again I have nothing planned. Like you, I've been making a lot of sweet potato fries lately AND I make chips too! Your idea with the greek yogurt for a substitute for sour cream is such smart thinking. I use yogurt, but greek yogurt is so much creamier. Always love seeing your weekly meals!! I am getting tomatoes in nearly every meal lately- can't get enough! your so organized with your meal plans! That's awesome! i had a tomato in my salad at lunch and i suspect my husband is cutting up s'more for dinner as i type!!! Yea. tomatoes are so cheap right now. I feel so superior this summer! Our tomatoes have been wonderful this year and Martha Stewart's rotted on the vine! How much fun was that? I've been trying to include tomatoes in every meal while they are plentiful. I'm going to roast some with olive oil and a sprinkle of salt tonight and serve them over angel hair pasta! ohh the grilled salmon and roasted veggies sound great! I probably eat one whole tomato every day - they are one of my favorite veggies! i LOVE all your meal plans - so organized! i need to start doing that again. mmmm tomatoes - i prob eat multiple servings of them a day. they are just so dang versatile! as for mushrooms, unfortunately, i am not a huge fan. if they are masked in a dish i am fine, but if they are the centerpiece, no thank ya! Everything sounds great!! I love the tomatoes right now, I just eat them as they are.. throw them in a salad, or slice & salt them! Yum!! That tomato salad looks amazing! Meal planning is something I think is such a good idea, both if you are trying to lose weight and maintain weight! It's also a great budget strategy. Yum, yum, yum - your meal planning rocks!! I go in and out of it - but i'm noticing when I don't write it down i'm not as consistent with with cooking so... I need to follow your lead!! Oooh you'll have to post the new recipe you create!! I've been eating lots of tomatoes (and lot of caprese salads!) - although mine don't look as pro as yours! I am so stinkin' mad at myself. I got my tomatoes in the ground late this year and all of mine are still green green green! That salad looks amazing! I see why it's your current fav! Tomatoes in season are the best ever and we like eating them dressed with olive oil, white wine vinegar, salt and pepper! 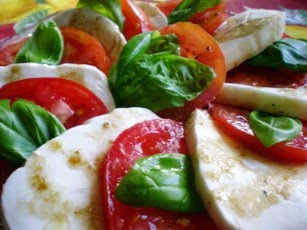 Not looking forward to the hardy varietals we get in Fall and Winter :/ Your caprese salad looks lovely!